Our professional guide and the driver will pick you up at your hotel at 9:30. The first stop is Esentepe, the impressive panoramic viewpoint overlooking Goreme. 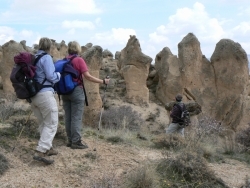 Here your guide will give you information on the history of Cappadocia and the unique rock formations. From here we visit the beginning of Rose Valley for an easy one-hour hike through fairy chimneys, orchards and vineyards. Our next stop is the Goreme Open Air Museum, a UNESCO World Heritage site. Your guide will explain the meanings of the frescoes in the cave churches, decorated with scenes of the Old and New Testaments dating back to the 10th century. The site has been used as a monastery since the first years of Christianity. For lunch we will visit a lovely restaurant in Goreme. After lunch we make several photo stops along the way – including Urgup’s family fairy chimneys, Devrent’s animal-shaped rock formations and Monk’s Valley with the famous mushroom-shaped fairy chimneys as well as St. Simeon’s monk cell carved into the rock. Day one concludes in Avanos, a picturesque town on river that supplies clay for the 4000 year-old Avanos tradition of pottery. A kick-wheel demonstration by a local potter and your chance at trying this ancient custom brings our day to an end. You will arrive back at your hotel around 5pm. The 2nd day of your Private Cappadocia Tour also begins at 9:30. Our first stop is the amazing Kaymakli Underground City. Carved by the Hittites about 3500 years ago, this multi-level underground city was used by early Christians as a main shelter from marauding enemies during the 6th and 7th centuries. Kaymakli is one of the biggest underground cities in Cappadocia with 8 levels including stables, temples and wineries. After departing Kaymakli, we will drive further south to the magnificent verdant Ihlara Valley. We walk alongside the Melindiz River for about 1 hour which winds its way through the Ihlara gorge, stopping for lunch in a restaurant on the river in the village of Belisirma. 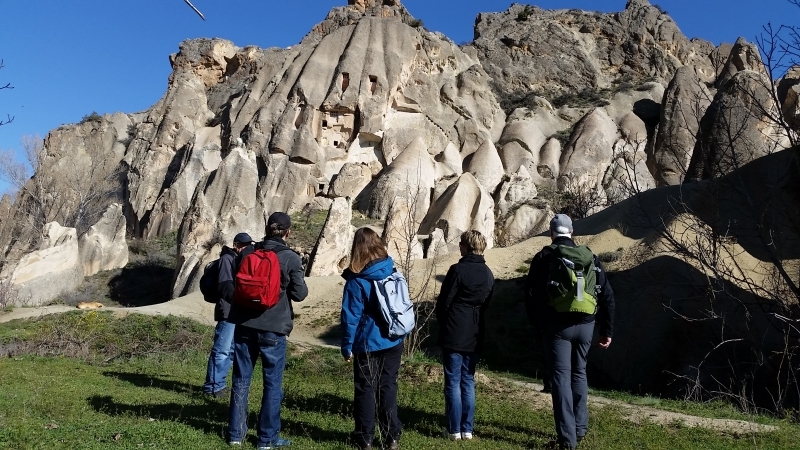 After lunch, we continue to the Selime Monastery, the largest rock-cut monastery in Cappadocia with large cave cathedral and breathtaking views over the area. On our way back to Goreme we stop at the spectacular vista point overlooking Pigeon Valley. Starting from your hotel at 9:30, we drive to Mustafapasa, famous for its beautiful architecture, Mustafapasa was one of the largest Greek towns in Cappadocia until the 1924 population exchange between Turkey and Greece. Your guide will give information on one of the biggest population exchanges in the world which caused approximately 2 million people to leave their homes. In Mustafapasa, we will see Greek mansions and churches as well as the Medrese seminary, an Islamic high school. The next stop is the Keslik Monastery, with one of the rare iconoclastic examples of Cappadocian frescoes. We will view these exceptional wall paintings and discuss the iconoclastic period (726-843 AD), in which such wall paintings were forbidden by the Byzantine Emperors. After which we will drive to Sahinefendi, to the Sobesos Excavation site. Archeologists have recently (in last 10 years) begun excavations of this area and continue to find many important artifacts. At this archeological site we can see Roman baths, tombs, basilica and mosaics. From Sahinefendi, we continue to Soganli Valley. Soganli was once the third largest monastic center in the area and boasts many cave churches and a beautiful hiking valley. Before beginning our hike, we will enjoy lunch at one of the local restaurants and see the famous Soganli dolls made by the women of this village. After our afternoon hike through the Soganli Valley we will drive back to your hotel. Along the way if you are interested in Turkish carpets we can also visit one of the local carpet workshops and view the traditional carpet-making process. Cappadocia remains the biggest carpet weaving areas of Turkey.